The ultra-portable studio is here. If you like the software and size is paramount, this is your friend. Fast, streamlined operating system. Ready to go out of the box. Expandable with new software and USB hardware. Touchscreen control can be a bit fiddly. Underpowered compared with today's laptops. 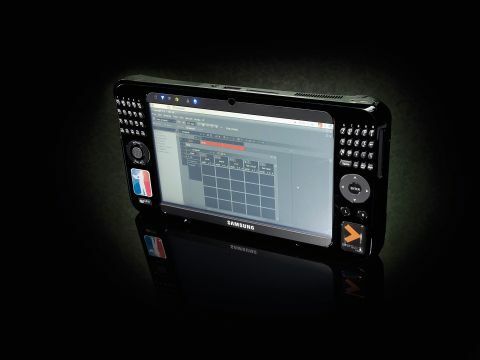 The Indamixx Portable Studio is built around the Samsung Q1 UMPC (Ultra-Mobile PC). It contains an 800MHz processor, 40GB of storage and 1GB of RAM , and sports a 7-inch touchscreen. Load up a streamlined OS and in theory you've got yourself the world's most portable music studio. The OS on test here was created by the brainiacs at Trinity Audio and has been christened Indamixx. It's based on the Linux platform and has been stripped of any excess fat and tweaked up to provide the fastest possible performance with the full suite of accompanying music applications. On board your Indamixx loaded Q1 you'll find specially adapted versions of Energy XT (DAW/MIDI sequencer), Adour (multitrack recorder), Audacity (audio editor), Hydrogen Drums (drum sampler/sequencer), VST Host (for Windows-based VSTs), Mixxx (Virtual DJ/Digital Vinyl) and some more synths, sequencers and music utilities. As you might suspect, the Q1's hardware hasn't been designed to provide professional studio quality recording and playback. The giveaway is that there's no input, only a headphone output. For serious recording, then, you'll need to attach an audio interface and that's where the USB ports come in. To keep things simple, we attached a plug-and-play interface/MIDI controller combo and sure enough, they showed up in the Hydrogen drum machine preferences, ready to go. This is no guarantee that it will definitely work with all other Windows/Mac hardware, though. This machine can handle a respectable amount given its 800MHz processor - it translates to about half a dozen hungry VSTi's and 16 tracks of audio with a moderate number of native effects before everything slows down. It can also handle multiple applications and audio routing between apps (eg, Hydrogen drums into Ardour for recording). It goes without saying that this isn't a machine that will replace the main computer for power hungry producers, but it has a certain allure for live performances, and the jet set globetrotters who need a decent sketch pad/DJ/remix tool. There's definitely enough scope inside to cover all these bases, as well as offering all the web-based communication tools of a WiFi-equipped PC. As far as value goes, a Samsung Q1 with XP can be picked up for about £450, which means the software suite and Indamixx OS add an extra £300. Out of that lot, Ardour, Audacity and VST Host are donationware, Energy XT is £30 and there are plenty of free equivalents of the rest of the apps. But what you're really paying for is the convenience of not having to waste a single second trying to get anything to work properly: it just does. Speed is the other issue, and the interface response is fast enough to provide a satisfying, glitch- and crash-free experience. Whether or not you gel with the 7-inch touchscreen/stylus combination is another matter. Personally, we didn't - we found it just a bit too fiddly and preferred using a USB mouse. This also brings the advantage of right-click menus and a generally faster workﬂow. Ultimately, if you can handle the ergonomics and screen real estate - and the supplied software is up your street - then this is a stable, productive platform to work with, no matter where you end up.